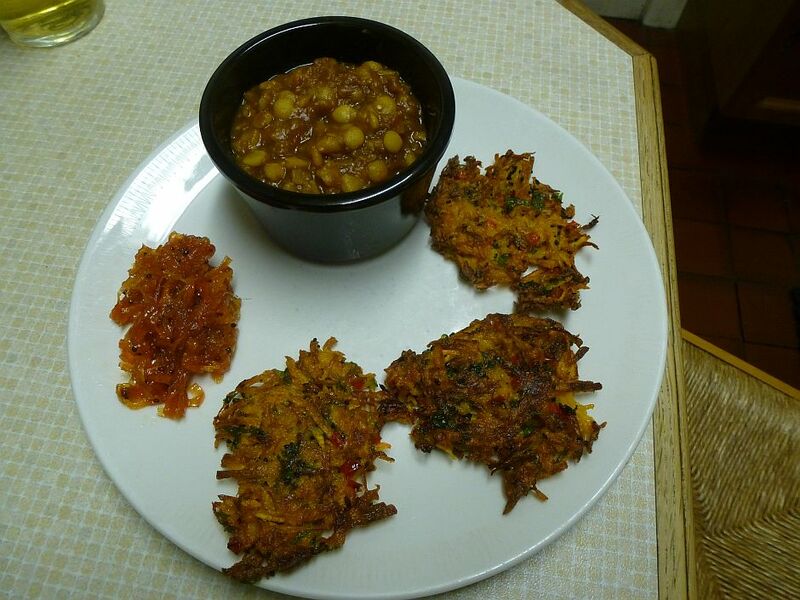 The recipe for Dal, Carrot Chutney and Butternut Squash Patties which follows is taken without alteration from the Daily Telegraph. I followed the recipe pretty much to the letter and although I enjoyed it I’ll make one major change next time – no Tamarind. The dal before the addition of the tamarind was sweet and earthy, just how I like it. I know that tamarind is the predominant favouring in HP Sauce, which I don’t particularly like, but I still put it into the Dal to see if I’d like it! 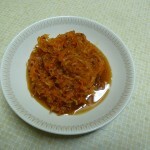 Another comment I’ll make is that the amount of Carrot Chutney, if you follow the recipe, is far more than you need for the recipe quantities of Dal and Patties. Best of the three dishes? 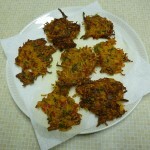 The Butternut Squash Patties which were also nice the day after eaten cold. Wash the dal in a sieve under the cold tap until the water becomes clearer. Bring one litre of water to the boil then add the dal, tomatoes, chillies, ginger, garlic, turmeric and a teaspoon of salt. Simmer for about 25 minutes, until the grains soften and break up. Whisk to make a smooth mash then add the lime and tamarind. Before serving, fry the curry leaves in a little oil over a medium heat so they do not burn. 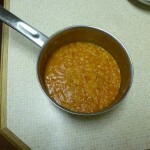 Remove them from the pan with a slotted spoon and scatter over the top of the dal. Dribble on the melted butter and eat with hot naan breads. 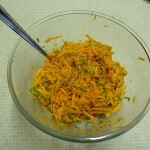 To make the carrot chutney, boil all the ingredients together, with salt to taste, until syrupy. Allow to cool. To make the crisp squash patties, mix all the ingredients together and then heat some oil in a pan over a medium heat. Drop a tablespoonful of the mixture in the pan, flatten with a spoon and fry on each side until golden on the outside and soft on the inside.